Pros: (1) the W/D work; (2) super close to the train; (3) a couple of boxes of free milk in the refrigerator for cereal, etc. (not just leftover from prior guests); (4) water pressure and hot water work; (5) better to sleep indoors than in Treasury Gardens. Very comfortable apartment which was always serviced to a high standard. The view from balcony and balcony itself was excellent. Close to cafes, entertainment with easy access to melb CBD. Apartment was comfortable and spacious. Very quiet. Great city views from room. Cosy foyer with lounges, fireplace, newspapers and fresh water. Most comfortable bed😀. For a family, the location simply couldn't be beaten. Bang up next to South Yarra station but without any noise at all. Had everything we needed for a family stay. Comfy beds, adequately equiped kitchen. Very clean and tidy. Nice balcony and city view. Location close to transport, shopping and restaurants. Location is nice. There're many nice restaurants for meal and shops for shopping. Also, it's close to the city center, so this hotel would be a good choice if you prioritize the location of accommodation for your journey. The layout of the apartment was excellent. Staff were friendly, helpful and welcoming. The property was 2 stops away on the train to Melbourne city centre and that worked out fine for us. The train station was literally in front of the property and the surrounding area is made up of mostly working professionals city apartments. There were lots of eating places nearby and a supermarket, about 5 mins walk away. We loved how it's more like a home away from home rather than just a hotel room. We booked a one-bedroom apartment and having a living/kitchen area helped to make our stay cosier. Having access to the washer and dryer also helped as we could do the laundry. There were other communal amenities as well: gym and hot tub - though we didn't get to try these. Lock in a great price for Punthill South Yarra Grand – rated 8.7 by recent guests! Punthill South Yarra Grand This rating is a reflection of how the property compares to the industry standard when it comes to price, facilities and services available. It's based on a self-evaluation by the property. Use this rating to help choose your stay! Punthill South Yarra Grand is centrally located, within walking distance of South Yarra Train Station. Some apartments offer views of the city and Port Phillip Bay. Offering open-plan studios and 1 and 2-bedroom apartments, all Punthill units have black and white furnishings and feature LCD TVs and DVD players. Kitchen facilities include a dishwasher. Guests can use the modern fitness center and large hot tub for free. There are modern sofas and an open fireplace in the foyer. Shops and restaurants on Chapel Street are only a 10-minute walk away from Punthill Grand South Yarra. The National Gallery of Victoria and the Victorian Arts Center are a short journey away by tram. When would you like to stay at Punthill South Yarra Grand? This open plan room features an private bathroom. Private parking is available on site (reservation is needed) and costs AUD 22 per day. The living and dining area are separate from the bedroom. This apartment includes laundry facilities. This room features 2 bathrooms and a separate living and dining area and includes laundry facilities. This modern, open plan apartment offers a fully equipped kitchen, an private bathroom and a stylish living area. This apartment has a balcony, cable TV and microwave. 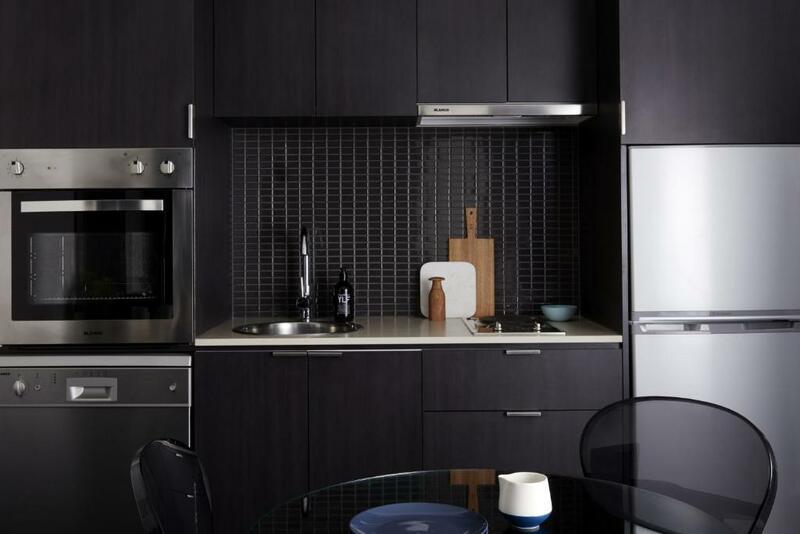 The eclectic, lush and stylish décor of our Studio, Deluxe, 1 and 2 bedroom serviced apartments reflect the vibrant, modern atmosphere of the South Yarra area and set a new standard in apartment hotel accommodation. Our warm and welcoming popular onsite managers are always spoken - reviewed highly and is a reason why guests return. Punthill South Yarra Grand has already proven to be one of the most popular accommodation choices for Melbourne visitors. Cafes and trendy boutiques with all the latest fashion adorn the nearby Toorak Road and Chapel Street, fresh produce is accessible at the famous Prahran Market and the Melbourne CBD is only 10 minutes away by tram or train. Area Info – This neighborhood is a great choice for travelers interested in culture, food and clothes shopping – Check location Excellent location – show map Guests loved walking around the neighborhood! House Rules Punthill South Yarra Grand takes special requests – add in the next step! All children under 2 years are charged AUD 9 per person per night in a crib. Debit card Punthill South Yarra Grand accepts these cards and reserves the right to temporarily hold an amount prior to arrival. Punthill South Yarra Grand accepts these cards and reserves the right to temporarily hold an amount prior to arrival. Please note that there is a 1.5% charge when you pay with a Visa, Mastercard, American Express or Diners Club credit card. Guests under the age of 18 can only check in with a parent or guardian. They must provide a current photo ID upon check-in. Please note a nonrefundable deposit equivalent to the first night’s stay will be charged 48 hours prior to arrival at Punthill South Yarra Grand. The outstanding balance will be charged upon check-in. When booking 6 or more rooms, different policies, prepayment and additional supplements may apply. Government issued photo identification and a credit card or AUD 500 cash deposit are required at check in for incidental charges. THE BLIND TO THE BALCONY WAS INOPERATIVE AND COULD NOT BE WOUND UP. WE HAD TO PUSH PAST IT TO ACCESS THE BALCONY. I GUESS THAT WILL HAVE TO BE FIXED. CHECKIN WAS QUICK AND EASY. IT WAS CLOSE TO THINGS WE WANTED TO DO IN SOUTH YARRA. PARKING WAS EASY STAFF WERE VERY FRIENDLY AND COOPERATIVE. CLOSE TO THE VENUE FOR OUR SON'S 21ST AND CLOSE TO CHURCH FOR EASTER. had to pay extra for parking, rooms are small, room key cards had to be re scanned at reception every day. The room had a bad smell from the moment I walked in. It was not pleasant at all. Not enough cutlery. No steak knives. They had plunger coffee but no plunger. Balcony plants were beyond dead and depressing to look at. The staff were friendly and polite. The room itself would have been great if not for one or two things that let it down. The wifi was great. Bed was soft and comfortable. It’s a very lovely apartment and the area is fantastic . The walls all need some attention - scuff marks snd dings. Wouldn’t take much to do. The location was brilliant. So close to everything - great transport options, excellent restaurants and cafes. So much to see and do. Location was great, apartment was neat and tidy. Air con not very effective in afternoon sun, even with blinds closed. No aircon in bedroom, so a bit hot/stuffy at times. One reported maintenance item ignored (albeit not too important) External balcony door not cleaned. South Yarra Grand highly rated & popular, so getting expensive to stay. One bedroom apartment very comfortable. Enjoy having a balcony. Location excellent near South Yarra station & local cafes etc. Good size fridge freezer & cooking facilities. Shower very good.